Brrr…it’s cold out there! Children are flocking to the television in hopes of hearing there will be a snow day; the bread and milk aisles at grocery stores are empty because of an impending snow storm; and utility trucks are out spraying salt or salt water on the roads. We all know why the first two happen – kids are excited for a day off of school filled with hot chocolate and snowmen. Adults are stocking up on necessities. But what’s up with those trucks? They’re working to protect drivers from slippery conditions by spraying rock salt or a solution of salt water to prevent ice formation. This salt is very similar to the salt you have on your dinner table – it’s the same sodium chloride, NaCl. There are some proprietary mixtures that contain other salts – such as potassium chloride (KCl) and magnesium chloride (MgCl) – but they’re not as commonly used. Road salt isn’t as pure as what you use on your food; it has a brownish gray color, mostly due to mineral contamination. Subjecting the environment to this salt via runoff can have some unintended consequences including negative effects on plants, aquatic animals and wetlands. But it’s a cheap and effective way to protect roads from ice due to a simple scientific principle: freezing point depression of solutions. The freezing point of pure water, the temperature at which it becomes ice, is 32 degrees Fahrenheit. So if there’s snow, sleet or freezing rain and the ground is 32 F or colder, solid ice will form on streets and sidewalks. 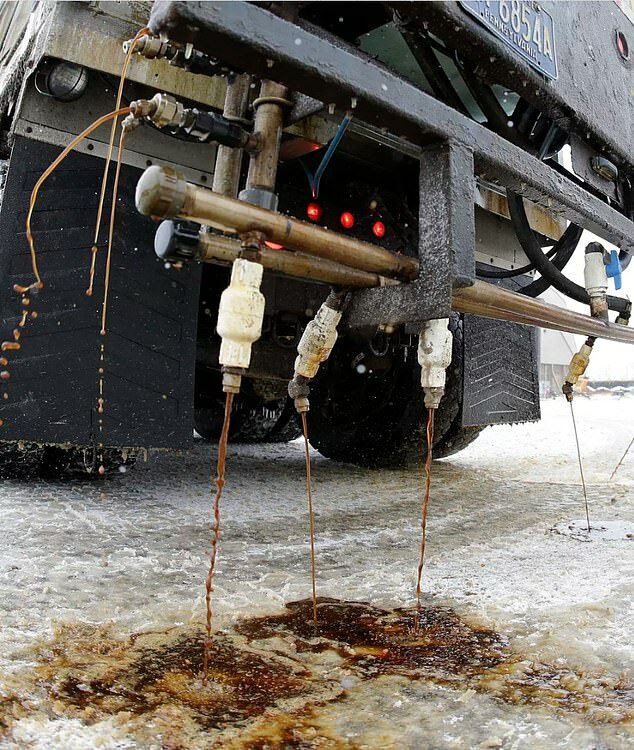 If the water is mixed with salt, though, the freezing temperature of the solution is lower than 32 F.
HOW DOES SALTING THE ROADS AFFECT THE ECOSYSTEM? In the past 50 years, chloride concentrations in some lakes and rivers quadrupled and, in a few, increased a hundredfold. Last year, a study in the Proceedings of the National Academy of Sciences concluded that more than 40 percent of 327 lakes examined had experienced long-term salinization, and that thousands more were at a risk. Researchers also estimated nearly 50 lakes in the study, including small ones in Minnesota, Wisconsin and Rhode Island, could surpass the Environmental Protection Agency’s chloride threshold concentration by 2050, potentially harming aquatic life. Experiments at the Rensselaer Polytechnic Institute aquatic lab in Troy, New York, have found that higher salt concentrations reduced growth rates in rainbow trout and decreased the abundance of zooplankton 7/8- tiny animals or larvae that are critical to the aquatic food chain and play a role in keeping lakes and streams clean. The salt impedes the ability of the water molecules to form solid ice crystals. The degree of freezing point depression depends on how salty the solution is. It’s important to note that the salt must be in a solution with liquid water in order for this principle to be obeyed. That’s why many cities spray a salt solution before any ice forms. Salt that’s dumped on top of ice relies on the sun or the friction of car tires driving over it to initially melt the ice to a slush that can mix with the salt and then won’t refreeze. 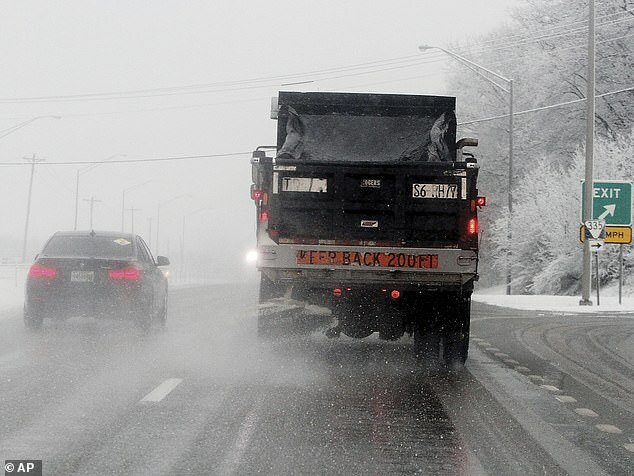 Pre-treating with solid salt relies on the warmer road surface to initially melt any snow or freezing rain so that it can properly mix with the salt. This is also why pre-treatment of bridges – which are colder than other roads – does not typically work, and why you see ‘bridge freezes before road’ signs. These salt solutions decrease the freezing temperature of water to around 15 F.
So, unfortunately for folks facing truly frigid temps, treating with salt won’t get rid of ice on their roads. An alternative strategy used at these lower temperatures is putting sand on the ice. Sand doesn’t change the melting temperature, it just provides a rough surface for your tires to prevent slipping and sliding. 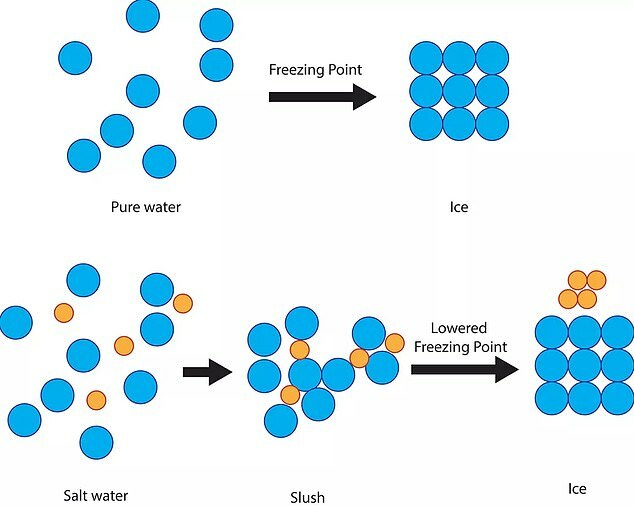 The science of freezing point depression can be applied to any solution, and many research groups have focused on developing alternatives with fewer negative environmental consequences. They include additives such as molasses and beet juice. So many you can look forward to cleaning not just white salt off the bottom of your jeans after a winter walk, but pink salt as well.